Put anything in front of this camera and you’ll appreciate the minds behind it. With over 60 years of photographic experience, Nikon is a world leader in imaging and high tech engineering. A remarkable result is the new COOLPIX S2500. The COOLPIX S2500 is lightweight, fun, and ready when you need it. Most important, it’s packed with Nikon technology. Its 12 megapixel sensor lets you easily take shots of your friends, family, and classmates in the most difficult lighting conditions. Plus, a 4x wide-angle optical Zoom-NIKKOR glass lens features a zoom range from 27mm to 108mm, so you can capture the entire schoolyard as easily as you can pull in on your best friend. And you’ll love the bright 2.7-inch display, with five level brightness adjustment, which makes it easy to see the screen, shoot a picture, and share it with your friends. COOLPIX puts the fun in fundamental photography. Introducing the colourful, popular, and fun COOLPIX S2500. It’s less than 2.54-cm wide and weighs less than 140 grams, so you can toss it in your backpack or slip it into the pocket of your jeans. It’s perfect for getting shots of you and your friends at school, at parties, or on the beach. And with several colour choices - this camera is as fashionable as it is portable. A lightweight camera with endless shooting options! With the versatile COOLPIX S2500 you can photograph your friends, family members, and classmates in just about any situation. You can choose from 18 different Scene Modes to create a specific setting, or simply let the camera automatically select one for you. Plus, you can create your own artwork by using in-camera editing functions like Quick Retouch and D-Lighting to adjust shadows and colours. This convenient, stylish camera gives you the flexibility to shoot what you want, when you want, where you want. Nothing tells a story like a movie. Class projects. Pet tricks. Championship games. These moments call for moving images, and the COOLPIX S2500 won’t let you down. This versatile camera shoots quality movies—complete with sound—at a 640x480 resolution. It also comes with a digital zoom control, so you’ll be sure to capture all of life’s most stunning, charming, and funniest moments. Plus, you can watch your movies on the bright LCD, or easily connect the camera to your home computer. 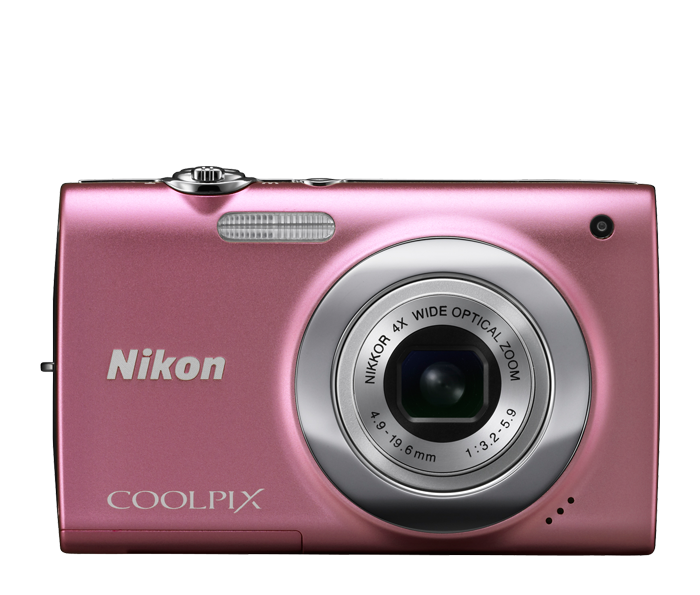 The COOLPIX S2500 is more than a colourful, take-everywhere camera. It’s Nikon technology at its best. This camera has a four-way Vibration Reduction (VR) Image Stabilization System that automatically reduces the streaky images associated with typical handheld cameras. It also has a motion detector that identifies moving subjects and adjusts the settings to eliminate motion blur. And with ISO speeds up to 3200, you can achieve shots regardless of lighting conditions. Nikon has also included its Best Shot Selector so all you need do is press the shutter once and let the COOLPIX S2500 do the rest—it will take 10 shots and automatically select the sharpest image. Better still, Nikon’s EXPEED C2 image processing engine helps ensure beautiful images. Smart features make sharp photos. Keep the COOLPIX S2500 handy and you’ll be ready for every photo op—and never miss a smile. This camera has a feature-rich Smart Portrait System that includes Smile Timer to instantly release the shutter when your subject smiles. Its Blink Warning technology alerts you when your subject may have blinked, and the Blink Proof feature captures two shots in rapid succession and automatically saves the best one. With functions such as in-camera Red-Eye Fix, Face-Priority, and Skin Softening, this camera practically predicts bad shots and fixes them before they happen. It even allows for macro shooting as close as 8.1-cm. And you don’t have to worry about losing battery power—the rechargeable Li-ion battery lasts for approximately 220 pictures.